The article is provided in translation from the Spanish language magazine Subastas. The work of expertising and cataloging masterpieces is one of the most important activities carried out by the auction companies, antique dealers and museums. The experts, not only risk their prestige and that of the museum or institution they represent, but also risk, not simply hundreds but thousands and even millions of Euros. It is not at all the same to catalog a painting of an author of renowned prestige, than attribute it to his circle, or to mention a certain school or epoch. From that decision the price is going to substantially depend, since it implies the dating and authorship of the piece. SUBASTAS a specialized Spanish magazine has requested the opinion of the most important auction houses about this controversial topic, and the experts have spoken with absolute clarity. From their words we assume that, sometimes, there is more will than resources and that, even more, a regulation of those activities on the part of the Administration or pertinent authorities would be necessary, such as it is in France, the country that several specialists cite as a model." Professor Antonio Perales Martinez is one of the most recognized experts in the work of Goya, besides being a very renowned skilled master restorer, has worked in the National Historic Archive and also in Spains National Institute for Historical Patrimony under the Ministry of Education and Culture. Professor Perales Martinez accumulates more than 33 years of experience mostly related to Goyas work. He has participated in multiple national as well as internationals researches and studies for the discovery and authentication of previously unknown Goyas paintings." To me, a good work of expertization must be done on two fundamental bases: the documental historical study and another physical and scientific. Professor Perales has devoted a great part of his life to the analysis of the work of Goya, perfectly knowing the Spanish Old Masters technique, which has allowed for him to develop and copyright (No.44.834/No.70.990 of the Spanish Intellectual Property Registry) an amazing system that may revolutionize the cataloguing of paintings of this Spanish Old Master, based on the micro-signatures, and other peculiar and personalized identification markings found in Goyas paintings. Luis Quesada is an expert in Andalusian paintings of the XIX century and author of twenty something books on the matter (among them The everyday life in the Andalusian painting and Light and fire in Spanish painting, which have afforded him notoriety as a specialist, but, first of all, he declares himself as a historian. I am not dedicated to expertise paintings, although collecting a high cachet only for signing a certificate should not be done without absolute certainty, although in the Art World there are many friends that bring me their paintings for me to see and offer my opinion. I am not caught in my books for giving false data and, of course, I feel capable of advising about the legitimacy of a painting. According to this specialist of the XVIII century, it is in the antique houses and the auctions where the best paintings are seen. Professor Antonio Perales Martinez, as a Spanish master technician specialized in the restoring of old masterpieces, whose forte is easel painting, has touched with his hands an infinity of Goyas engravings, water colors acuarelas drawings, palettes, old parchments, hand fans, ivories, and, above all, paint on wood and canvas. According to him, each stroke, blurriness, line or dot have their sense in the work, a sense that transcends the aesthetic to convert into a mark of its author. Authentic Goyas could be being auctioned as anonymous paintings, according to Professor Antonio Perales, a most skillful technician in masterpiece restoring who, after 33 years of work, has developed (and patented) an ultramodern theory and scientific method to irrefutably identify the work of this genial aragonés artist, Francisco de Goya y Lucientes. The secret lies in the micro-signatures, minuscule identity signals that Francisco de Goya inconspicuously cleverly spread through the painting. But first and foremost, as in any scientific methodology, a set of prerequisites have to be met in order to initiate the detailed and meticulous scientific analysis for certification and authentification. According to Professor Perales, thanks to the meticulous study that he following describes, he has been able to positively identify as authentic Goyas paintings that were NOT attributed to the Spanish Old Master de Fuendetodos, or wrongly attributed to other painters. Pigment analysis: A thorough chemical analysis (chromatography) of the pigments composition and make up. A renowned Spanish Chemical Laboratory (Laboratorio para el Analisis, Restauracion y Conservacion de Obras de Arte) highly specialized in this particular field of investigation and identification of works of art is used. 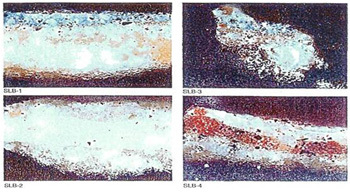 This allows identifying if the pigments are corresponding to Goyas epoch elements composition. Photography: General high quality color photo prints, detailed sections of the painting, using color filters, magnifying lenses, macros, approximation ring, etc. Intensive visual analysis: Using high powered magnifying lenses and under intense light conditions, an in-depth visual observation for small rubrics, graphisms* (*more in following articles) or micro signatures hidden in inconspicuous places all throughout the paintings surface. Data compilation: If all of the precedent tests, plus all the classical tests and appreciation studies are positive, we practically can then affirm, with no margin of error, the authenticity of a work by the hand of Francisco de Goya. 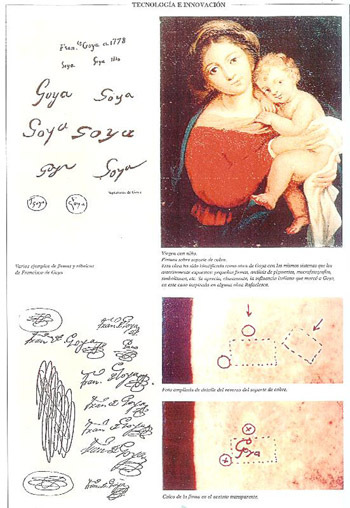 Disbelievers have always existed, who have not wanted to recognize these markings arising from light and color, the same way that they did not want to recognize the small signatures and writings that Goya included in all his works. They can be observed by detailed analysis with a magnifying lens, going over it centimeter by centimeter. Goya painted works that even to date are considered done by Velázquez, Vicente López, Rubens, Rembrandt, Rafael the one from Verona, etc. The confusion exists because a painting that has been misattributed to another author carries its bad attribution and no specialist wants to go back to the already studied and catalogued, because he/she does not want to rectify the opinion of the first expert. But this group technique, according to Professor Antonio Perales, is neither good for the universal culture or for that of our own country (Spain), nor for anyone that considers himself/herself honest, because if a work of art is misattributed, one must be brave and tell the whole truth and therefore be given due credit. There is nothing wrong about acknowledging a mistake, more so, considering that at that time, there were no technological means like the ones we have today, to study the works of art. It has always been sensed that, according to Professor Antonio Perales, the creations of Goya have been subjected to manipulation. For example, the Metropolitan Museum of Art, in some troubled acquisitions of the work of Goya, and after constant study and investigation that were carried out in that institution, in 1995 reached the conclusion that only 7 of the 17 oil paintings of the collection met the standards of authorship done by the experts." The changes in criteria among the experts and connoisseurs of the work of Goya have been constant and as a consequence of this mistake many of the artists youth works have not been attributed as such and, to this day, many still go as anonymous. Goya was indeed very prolific worker, of an extraordinary fast execution to whom a couple of sessions would often be sufficient for portraits painting. Therefore, the numerous works of his youth as well as those of his later years should be justly attributed to him without ambiguities, mistakes and it should be done unequivocally and in a verifiable, repeatable scientific manner by anyone properly qualified as to leave no room for any doubt. The restoring of numerous works of Goya has lead this specialist to clear a very intricate path, sometimes intimidated by the magnitude of the work of this genius, touching his linen cloth canvases, and soaking himself in his art. I have discovered declares Professor Antonio Perales to Subastas  what I would have never expected and that gave me the greatest surprise of my life and an immense joy: the micro-signatures of Goya. , getting to discover how much is created by desire or by devotion or when he does it due to economic necessity. The works of his youth or his maturity have traces that define them; something new is always defined, nothing repeats itself. Examining my first Goya I spent hours and hours says Professor Perales-, studying the painting in all of its facets. The study of lights and shadows did not correspond to what is normally studied in the art schools. Light appears in first plane, while the zone of half-shadows and shadows remains in a second plane. It is in that zone of shadows where a site of light attracts the attention powerfully; so I started to turn the painting in all directions, until I got to decipher what that illuminated zone wanted to convey to us. The painter utilizes symbolic values that speak to us through colors. There appear semi-hidden signatures, diminutive, zoological symbolisms repeated throughout the entire surface of the canvas, or any other media; engraving, drawing, fresco, lithography, tin, copper, crystal, wood, marble, etc. Goya utilized very thin brushes and feathers, with which he writes his micro signatures. Personal impressions (especially in Los Caprichos) that the artist made of the most distinguished personalities of his time, like the Queen or Godoy, or so many other aristocratically respectful characters of his era. 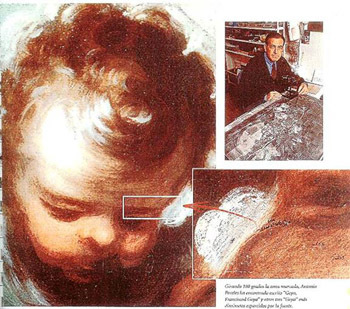 Precisely, it is that by performing exhaustive modern laboratory tests, it has been possible to uncover works dating to the time of Goyas youth, those works that the artist did not classically signed but only used rubrics. Likewise, there has appeared part of some of those works that he did for Cornelio Van Der Goten, when he was required to do so as Painter of the Royal Factory of Tapestries. Goya not only painted cartons, but many works inspired on different artists of diverse schools and styles. Professor Perales reaffirms himself in his theory after having studied works that GOYA painted after his stay in Italy and that have been (wrongly) catalogued as of Italian provenance in the so-called cuaderno italiano (Italian portfolio). Despite Goya was very prolific, his catalogued work is scarce. So, in the last catalogue of his paintings, composed by the late professor José Luis Morales y Marín, there appear 567 works. The one edited by Pierre Gassier-Juliet Wilson reflects 1,870 works, between graphic work and painted work. It is very unlikely that an artist who started painting at the age of 17 and that dies still painting at age 82 leaves only those few a little more than 1,800 works, and there are experts who are of the opinion that Goya left at least 5,000 works. Picasso was much more prolific and notwithstanding, his work has not devaluated in the least. Francisco de Goya continued painting during his old age in Bordeaux, although in many cases he would no longer use brushes, but he would use all sorts of instruments, including old rags, to do his creations. He painted a great number of pictures of small format of Still Nature, he would walk through the markets, retained in his mind what he had seen, and would reflect it in a painting upon getting back to his studio. According to Professor Antonio Perales, nowadays we have technical means that allow us to correctly and accurately expertise these paintings of Goya, quite a goal for us to feel proud of, beyond the existing conflicts of interest and speculation. A trait, a stroke, a sign, a stroke, a graphism, a rubric, a number or an animalistic symbol that make that his works are beyond confusion, and the technology makes this all visible. These discoveries are registered at the Registro de la Propiedad Intelectual (The Registry of Intellectual Property), acquiring judicial validity according this expert. 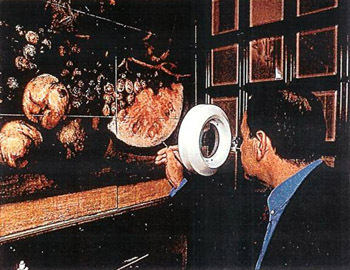 Among the works most recently done by Professor Perales, stands out the exhibit sponsored by the BCH in 1999, entitled Recovered Masterpieces, in which there were several paintings restored by Professor Perales, like The Virgin with the Child and San Juanito, of Luis de Orales, Ecce Homo, of Simón de Vos, Llanto de Adán y Eva sobre el Cuerpo de Abel attributed to Cesare Rancanzano. Having been sent by the Spanish Ministry of Culture, he worked in Quito (Ecuador) at the San Francisco Convent, training restorers and lecturing at the Central Bank of Ecuador and at the House of Culture. He also made reports of the churches at Plaza de Cuzco (Perú). He has participated in assembling the exhibit of Filippo Juvarra, in the Royal Palace and in the restoring and mounting of the works at the exhibit of the MEAC, entitled Private Spaces, as well as the samples of the Ages of Man, among others. One of the growing numbers of authors and scholars who agree with the findings about Goyas unique self authenticating technique proposed by Antonio Perales is Agustín de la Herrán, who publishes several books between 1956 and 1962 about the symbolism of Goya. Likewise, similar texts have been published in The Spanish Present Time (1970) where an article was published in which other Goya connoisseurs speak about the micro signatures and other symbolisms. Moreover, these theories have already been published in the media by The Herald of Aragón and channel Antena 3 of the Spanish T.V... In Italy, there is another Goya expert, Paolo Erasmo Mangiante, who openly coincides with the same theories. If we accept this micro-signature technique to identify the works of Goya, three inedited paintings of this author (one of Carlos IV, another of Agustín de Bentancourt, and a third one of Juan Subercase) might be hung at the School of Engineers of Camino somewhere in Spain among , perhaps, so many others somewhere else in the World. or for simply discard it! The above is part of a series of articles published by the Spanish Magazine SUBASTAS. Reprinted by permission. Translation may not accurately portray specific Spanish expressions or be totally literal. BIO | ARTWORK | BOOKS | RESOURCES FOR STUDENTS | LINKS | CONTACT | NEWS | STATS | F.A.Q.